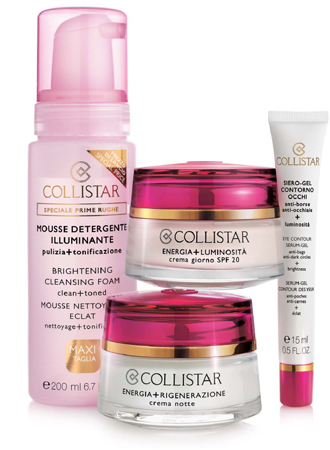 Collistar launches its new Special First Wrinkles Line, created to tackle skin problems emerging when it is too soon to use an anti-age product but too late for the basic specialties. 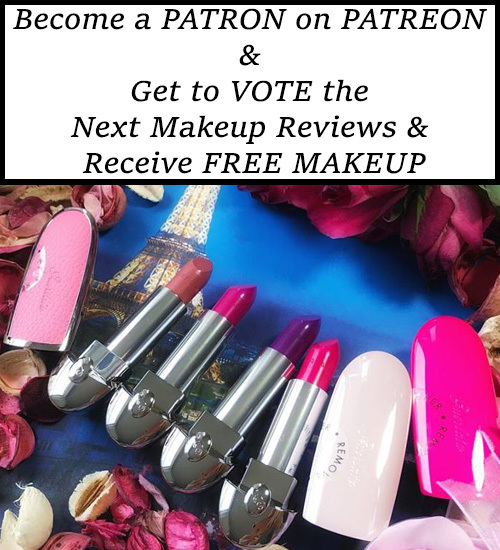 An increasing number of young women, in fact, feel the need to use high-tech and high-performance cosmetics to prevent signs of aging, which today make their appearance earlier than a few years ago, due to greater stress, increased pollution and a more unhealthy lifestyle. The formula of the Special First Wrinkles Line is based on the combination of 3 high-performance active principles, each selected for its capacity to act specifically on the various problems of the skin: Oligopeptide 20, extract of Litchis and Trehalose. These active principles work together to ‘nip in the bud’ the first signs of skin aging. Check out the entire collection with details about products and more photos right after the jump. A new way to cleanse the face, ideal in the morning to arouse the vitality of the skin and at night to purify and prepare it for sleep. Thanks to its special water-based formula, which magically transforms into a foam when dispensed, it gently removes makeup and impurities while, at the same time, toning and moisturizing the skin and giving an extraordinary radiance to the complexion. In addition to Litchis extract and Trehalose it contains extract of Aloe for an intense sensation of freshness and comfort. During the day the skin is severely tested by external aggressions, stress and the increasingly frantic pace of life. To preserve its youth this cream acts on various fronts. Energy The precious Oligopeptide 20 boosts cell turnover and stimulates the synthesis of collagen and elastin, keeping the skin toned, elastic and compact. 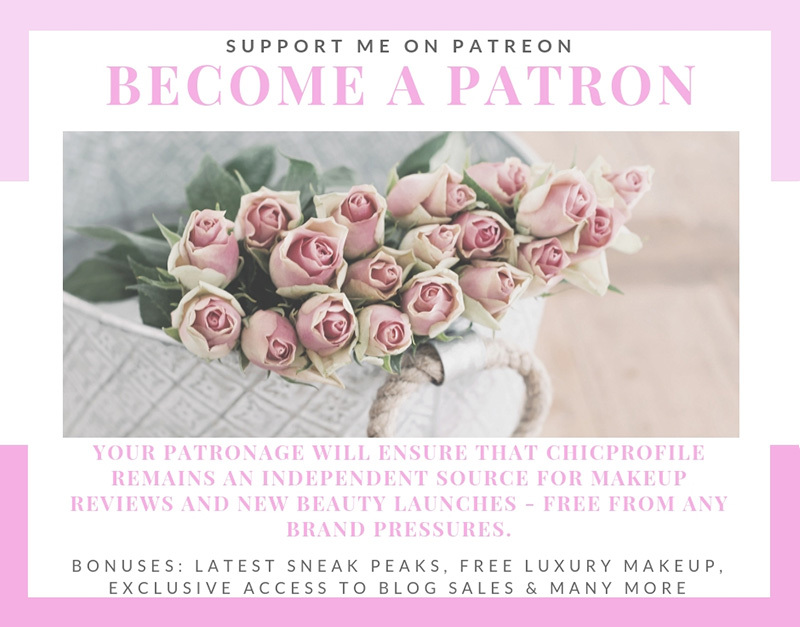 Radiance The illuminating action of Litchis is potentiated by the Lupine extract which, by stimulating the micro-circulation and oxygenation of the skin, instantly lightens the tone of the skin and leaves it fresh and radiant. Special multi-reflecting powders optically accentuate the illuminating effect,giving the complexion a smooth and flawless appearance. Protection Extract of Litchis and a special blend of UV-A and UV-B filters guarantee active and multiple protection against environmental stress, ultraviolet radiation and free radicals, which are the cause of premature skin aging. Indispensible hydro-nourishment is guaranteed by the addition of Trehalose as well as Cranberry oil, which is exceptionally rich in essential fatty acids. Results Soft and silky, this cream blends instantly into the skin, recharging it with energy and giving it instant and extraordinary radiance, tone and smoothness. Used daily, it revitalizes the skin and prolongs its youth. During the night the skin is recharged with energy and regains the strength needed to combat stress and daily aggressions. With age, but also when we sleep little or badly, the natural process of self-regeneration tends to slow down. 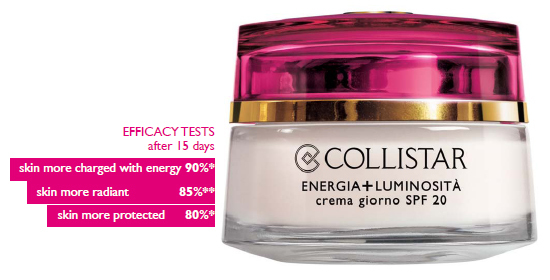 This cream is designed to provide an extra supply of energy and intensify night-time cell regeneration. Boosted energy and regeneration To ensure an ultra-intensive action, Collistar Researchers have combined the energizing power of Oligopeptide 20 with the regenerating properties of an active principle of marine origin extracted from Polynesian micro-organisms, which acts on 2 fronts. On one hand, it stimulates the formation of two proteins, filaggrin & involucrin, which play an essential role in cell turnover. It performs a controlled micro-exfoliation which removes dead cells from the surface of the skin, leaving it smoother, brighter and more even. Repair Thanks to the addition of Desoxine Bio, a detoxifying substance extracted from Myrtle, the cream stimulates skin cell respiration and performs a repairing action, helping to eliminate toxins accumulated during the day due to pollution and atmospheric aggressions. Intensive nourishment This is guaranteed by a concentrated blend of Shea butter and Rice and Blueberry oils. Results Right from early morning the face is fresh and bright, skin smoother and more vital, and wrinkles are visibly reduced. 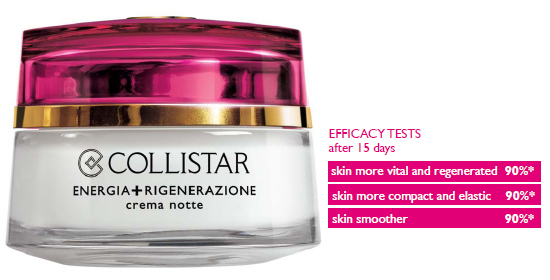 Night after night, it benefits from a real global regeneration process, ultra-effective in combating skin aging. An intensive treatment with super-rapid effect – in just five minutes the face acquires extraordinary freshness and vitality. The complexion becomes ultra-radiant, small wrinkles and signs of fatigue disappear, and the skin appears renewed: smoother, more elastic and velvety. 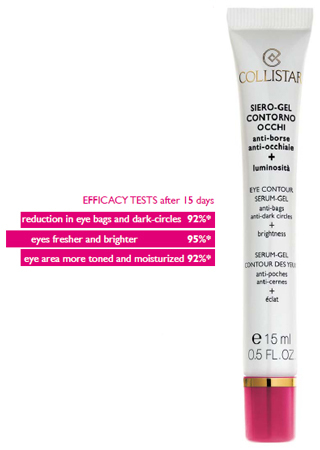 The super-effective formula contains a concentrate of three high-performance active principles, as well as rice oil, reconstituted NMF (Natural Moisturizing Factor) and vitamin E.
Particularly fragile and prone to wrinkling and premature aging, the eye contours require an ultra-specific treatment. Gentle but effective, this exclusive serum-gel is able not only to combat the first wrinkles, but also to immediately reduce eye bags and rings and signs of fatigue. Immediate smoothing, anti-bags and anti-dark circles effect Fresh and ultra-absorbent, the product performs an instant illuminating action and in seconds smooths out the eye contours, flattening fine lines and minimizing eye bags and rings. The product owes its effectiveness to a special complex based on plant extracts with draining properties, organic silicon and vitamin PP which stimulate the capillary micro-circulation, thereby reducing and preventing the problems typical of the eye area. What creams are you currently using? Are they anti-aging and satisfied your skin needs?